I’m not going to make any excuses for ‘being away’, but let’s just say that it’s been a miserable spring. Miserable weather-wise and miserable in many other ways which made me frankly not in the mood to share much of anything. But, I did keep things going in the greenhouse and once things finally warmed up here (which basically has only been in the last two weeks), we were able to get out into the garden and start putting things in. We had two massive frosts during this same period (I was starting to feel as if we were having weather whip-lash here) — literally going from the high 80s to the mid 20s — having to run out and cover up the berry bushes and spray the apple tree because the heat had pushed the tree to blossom all at once (spraying a fruit tree when it’s in blossom in the evening before a big frost will help protect the blossoms from being killed). And then, the next day, having to run out and uncover everything again the next morning. It’s been a crazy spring. But one of the experiments I’ve been doing this year has been working very nicely. As you might recall, I started seeds from a couple of veggies bred to work in containers. Not everyone has the luxury of space for a garden and I wanted to see if growing veggies in containers would work for me, too. We have a deck with a pergola on it on the south-facing side of our house, so it gets plenty of sun. 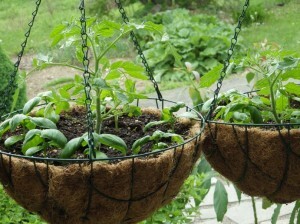 Hanging planters tend to suffer here — a lot, and I have to seemingly water all the time. So, I started seeds for peppers and tomatoes that are selected for container growing (they are relatively short plants, don’t sprawl and the fruit is relatively small) and I’m trying out a clever little trick. So far, it looks as if it is working. What I did for these was, to be blunt, using disposable diapers in the bottoms of the hanging baskets (ok, you – stop sniggering back there). Disposable diapers (which I happen to have around for the grandmunchkins) have, in their linings, the same polymer granules that are found in garden supply stores under trade names like ‘water-sorb’ and the like. The price of these in those teeny little packages is amazing – $3.50 for a couple of tablespoons. A disposable diaper can be had for less than $.50 USD and there is a lot more than a couple of tablespoons in it. In addition, because the outside of the diaper, cleverly enough, is waterproof, it forms a barrier to water loss. So far, I have not had to water those basket planters more than once a week (and we have not had all that much rain here). How I used them: I unfolded the diapers and trimmed off the elastic side wings. Then, I put about an inch of planter mix in the bottom of the planter and put the diaper in, waterproof layer DOWN. I then sliced the liner all the way from the bottom to the top and also across the bottom and the top and opened the slit up. Holding the edges away, I poured in several cups of water (the bigger the diaper, the more water this will hold. The granules soaked up the water and expanded. Again, holding the slit open, I poured in planting mix and made sure the opening stayed open. After I filled the basket halfway with planter mix, I planted a combination of a tomato, a pepper and some basil plants and filled the planter the rest of the way, and gave the planters a good watering and hung them up. 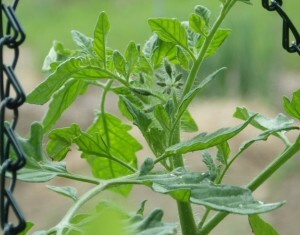 As you can see from the photo at the top, they are doing really well — the tomato plants have really taken off and the basil looks really good too. The peppers? hmmmmm. Not so much. We’ll see how this goes for the rest of the summer. The tomatoes, which are the variety “Tumbling Tom” have taken off so well that, as you can see from this photo, they are all starting to flower. It’s not even JUNE yet. This is GREAT. We’ll have fresh tomatoes and basil before we know it. Another experiment with containers is growing leaf lettuce. Now, I started this mix so that I’d have plants to plant in the basket, rather than just throwing the seeds in. This has worked really well also. I was inspired to do this by seeing a photo posted of a small globe basket planter which had been planted all over with different colored leaf lettuces. Mine is just in the top. But, just as another experiment, I figured I’d try growing some of the lettuce plants around the sides of the tomato baskets as well. 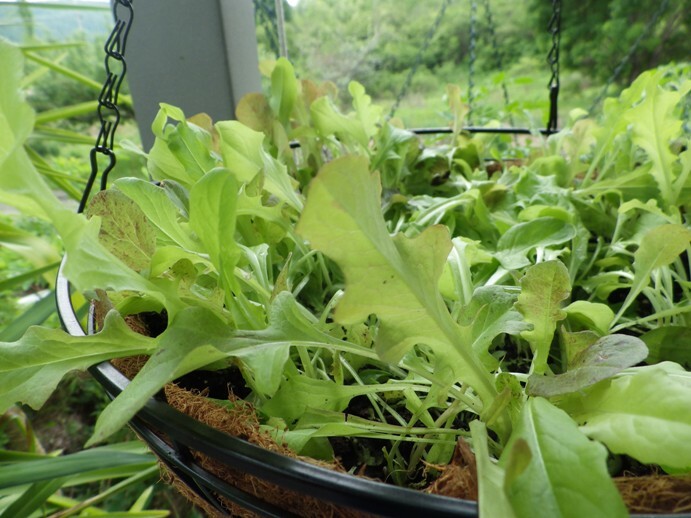 Frankly, what I did was to just poke a little hole in the sides of the baskets (a pencil would work as well; I used my fingers), insert the lettuce plants and firm down some planting mix around the roots on the inside. If I were going to try to reproduce the globe basket planter trick, what I’d do is fill up each half of the planter with mix and put something like a piece of plastic or heavy cardboard over the circular opening and hold it down (wire? duct tape). Then, I’d flip it over and make holes all over the basket on the bottom, insert my lettuce plants, give it a good soak and leave it, plastic (or cardboard) facing down, for a week to setting the plants in and give them time to put out more roots to firm themselves. After that, I’d take the plastic/cardboard off and fasten the two halves of the globe together again and hang it up!! But for the moment, what you get to see are my little experiments. What else is going on in the garden? Well, we are trialing four different types of garlic this year. As you may recall, we planted all of them in October (which is what works here), and by late April, all of them were up, but two of the four varieties did not look so good. They have caught up at this point, but what will be important will be the end of the trials, when we pull everything out and weigh what we’ve got (my favorite part). Best variety gets to stay. Certain vegetables are not making any appearances this year – beans and carrots are two. We’ve got kohlrabi, swiss chard, pak choi, beets and onions in the garden. Potatoes – nyet. I’ve got another experiment to try in terms of growing squashes this year, using a frame; I’m hoping this works to keep them from sprawling all over the place and our having to keep whacking them back with the lawn mower before they eat the car. Have a good week and eat something GREEN!! 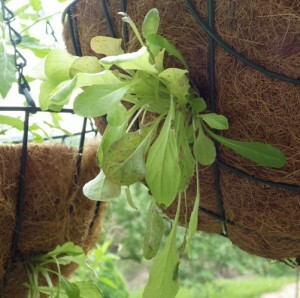 Posted in: Food, gardening, Raising It, Uncategorized. Welcome back! It’s been a miserable spring in Maine, too. We’ve had weather whiplash here – snow on Saturday, 85 on Sunday, a balmy week, then 85 again on Saturday, 40 today. And it seems absolutely everyone has had an upper respiratory thing that hung on for weeks. I lost most of May myself. Which is by way of saying we’ve missed you and been worried. Not to worry about me, I’m the “Woman of Steel” (tm pending and all that). At this rate, I’m thinking that the only tomatoes I’m going to get are the ones in these baskets because, if more frosts threaten (yes, I know it’s June, but dayam, it’s COLD), I can just bring ’em into the greenhouse overnight.